In an effort to save cost, we want to automate the radiators. 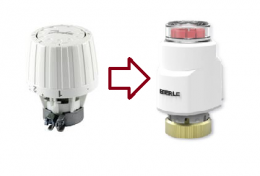 There are 2 Eberle TS Ultra available to replace current radiator knobs. Problem is, they don't fit on the current valves. Identify the knobs on the radiators. More (silent) fans. Someone donated maglev fans, replaced all the fans on radiators. Apply isolation to radiator tubes that do not need heating.